I must preface this review by stating that I am a bible believing Christian. I believe that salvation is for those who call Jesus Christ Lord, and is available to all who do. I received this book with the understanding that it is a "Christian" read, however, not only was I was terribly disappointed in it being labeled as such, I was incredibly disturbed by the doctrine presented. I do believe after having read this book that Mary had a supernatural experience and passed over the threshold from life to death, and being a believer in Christ, which she openly acknowledges, I am certain she was destined to live out all of her eternity in Heaven. However, it seemed as though she believed this to be the case for all who pass from life to death, and even mentions in the book that if the person who passed did not have saving faith upon death, then the gate would be an opportunity to then choose Jesus. I felt like much of the book was simply impious, distasteful and I found myself sorry that it was available to people who do not know Jesus, as I felt this book written to assure everyone that what Mary experienced will be the norm for everyone, as she makes no clear assertion otherwise; meaning she never once connects her belief in Jesus Christ to her being ushered to Heaven's gate.Mysticism was also interwoven in much of her recollections throughout this book: she communicated with an angel through an owl, a woman's deceased husband spoke to her in a dream in order to warn Mary about being careful(after the accident had already happened),and trees supernaturally blooming just to name a few. There was heavier emphasis on these signs and presence of angels than on the Lord God himself.The most disturbing thing for me to read in this book was Mary's use of the name Jesus and "the angel" interchangeably when referring to lucid dreams/visions she had while in the hospital.One day when I meet Jesus, as any Christian can attest themselves, I should know for certain when I am in the presence of my King, and should hope if anything to worship at His feet in complete love and adoration, not carry on a casual conversation with him, uncertain of who he was exactly.As a follower of Jesus Christ I found this book to be a terrible representation of Christian doctrine, and believe it to be damaging to the progression of the Gospel, giving people a reason to rest easy while they are here, and worry about eternity when they get there. John 14:6Jesus answered, “I am the way and the truth and the life. No one comes to the Father except through me. WaterBrook Multnomah Publishing group has provided me with this book complimentary for review purposes. One of the things I liked most about this book was that it's clear that Dr. Neal isn't a writer, and I don't mean that in an offensive way at all. Her prose is very simple, with little (if any) embellishments, flowery language, or complex syntax. And the reason why I like that for this text is because it adds authenticity to her story. She's not a charismatic, artistic type trying to sell a story or argue her own point of view... she is very much just a medical professional who has led a life that's been repeatedly touched by God's amazing power, and who feels that she has an obligation to share those stories with the world.I wasn't reading her story through the lens of someone trying to "sell" an ideology to me or someone who was trying to make the story more sensational (though that would be hard to do!). Dr. Neal's book is an honest, straightforward account of how God changed her life, and it's clear from reading it that she's only interested in telling the story; she doesn't need to gain anything from it.Moving away from that point, Dr. Neal's life story in and of itself is a MAGNIFICENT display of God's incredible power and love! Time and time again He not only lead her life, but brought her through trials that would have destroyed many other people who would have tried to get through them on their own. I was very much inspired when reading this, and I honestly teared up more than a few times throughout the text. In a time when so many people try to downplay the existence of God and His power, it's so heartwarming and encouraging to read this very frank account from a very scientific person who was raised and trained into the very culture of questioning and skepticism that many use as a weapon against the faith. Dr. Neal's story is incredible, and I recommend this book to anyone who needs a reminder of just how fantastic God's love for us is, and how real is His ability to intervene in our lives when we need it or ask for it. It reads very quickly (I finished it in just one night! ), so this is a great book even for those of you who are pressed for time during the week. 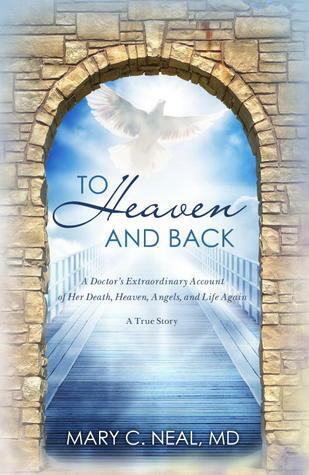 To Heaven and Back is "a doctor's extraordinary account of her death, Heaven, angels and life again" and is supposedly true is all aspects.Allow me to preface this review by stating that this opinion is coming from a born-again, fundamental, Bible-believing Christian. As such, I found this book very disturbing and feel that the best place for it is in the garbage can. I know that sounds harsh, but I feel this book contains several elements that could prove to be extremely hazardous to Christians and non-Christians alike. Allow me to state a few examples:1. Ms. Neal gives readers the idea that a Christian following God's direction will not encounter troubles. In her words, "when you are doing God's will, everything seems to happen without much effort or many obstacles". Say what? Read the Bible, and you'll discover the exact opposite is true. David was a man after God's own heart, and he faced obstacles. Job was a good man and full of integrity, yet he lost everything he held dear. Paul was the greatest missionary to have ever lived, yet he was imprisoned countless times, stoned, beaten, shipwrecked, and the list goes on. Satan knows how to put obstacles in our path too. He doesn't want us serving the Lord. I fear after reading this, there will be Christians doubting their life's direction because they've run into an obstacle or two. My dear Christian, if this is the case, please know that those obstacles are a pretty good sign that you are on the right track.2. Ms. Neal claims to have experienced salvation during her baptism. Salvation occurs when you accept Jesus Christ as Lord over your life. It has nothing to do with baptism except that baptism is an outward show of an inward change.3. Ms. Neal admits that she felt God was a "Sunday thing" and spent the majority of her early life ignoring Him. Yet every time she found herself in a difficult situation, she "remembered" to pray and God jumped in to meet her need exactly as she saw fit. Again, I fear we have Christians reading this and wondering why God doesn't work that way for them. God doesn't work that way for anyone! God is not a genie in a lamp. He is not at our beck and call. We either have a relationship with Him or not. We can't ignore Him and then expect Him to jump every time we call.4. Ms. Neal uses quite an imagination in describing how children actually abide in Heaven before being sent to earth and that they remember Heaven when they're young. So if that's the case, child-like faith isn't faith at all. It's just memories. Additionally, she tells of communicating with angels and of others who communicated with their dead loved ones. Okay, if you say so.5. Beyond that, there were events that were described that were beyond miraculous; they were downright fictional. Please don't misunderstand me. I believe in miracles, and I believe God can do the impossible and unfathomable. However, for one person to have experienced so many HUGELY miraculous events is just very hard to believe.6. Last, but certainly not least, Jesus was hardly mentioned at all in the book. Yes, this woman went to Heaven, but yet angels and light and gardens get more mention than Jesus. And the few times she did mention Jesus, His name was used interchangeably with "the angel". Jesus is not an angel. He is the Son of God. Surely, a book about heaven should have more focus on Jesus and less on self, right?I hope that you understand why I'm so emphatic about my opinions on this book. It is "feel good" fiction like this that is leading hordes of people away from true salvation and a true knowledge of Christ. And as a Christian, I feel it is my responsibility to warn others of the dangers I see lurking in these areas. I do so with love, for I want to do as God commanded and speak the truth in love, seasoned with grace. And so, my friends, consider yourself warned!I received this book from Waterbrook Multnomah for the purpose of this review. Obviously, I was not required to write a positive recommendation of this book. I love reading about Near Death Experiences. I've read quite a few different accounts and love to see their similarities and differences. I was surprised by how small of a role the author's actual near death experience played in this book. It is much more of an autobiographical - life lessons learned kind of a book. However at the time I was reading this book those life lessons were exactly what I was needing to hear so this book really rang true to me. At the time my own son was struggling and we were just day away from taking my son to the hospital where he would end up spending 5 weeks. If I read this again today I'm not sure how I would react to it but at the time I read it I felt like it was one of those books that I picked up for a reason because I needed what it gave me. Life is spiritial journey and second chances are real with God. After having worked in the medical field for many years and seeing death first hand I was immediately interested in reading this title written by a real life medical surgeon who had a real near death experience. Throughout my lifetime I have read many real life NDE's of those who either through traumatic injuries or illness passed away only to later be revived and describe in as much detail as possible what they have seen. This however is the first I have read a NDE coming from a medical surgeon. As most stories of this nature what happened to Mary C. Neal in To Heaven and Back is a unique experience. Mary not only drowned, she was dead for over 15 minutes before coming back to life. Although short in nature Mary then describes her spiritual journey. Mary was given much insight into her life and that of her family. I truly believe Mary's story is sincere and she experienced what she did as she described many common events that are unique to someone who has experienced an NDE. While I do not believe Mary described being in the presence of Jesus I do belief she was amongst spiritual beings and enlightening insight was given to her. I have already come across many NDE's who described being told that to a point we humans are given a choice as to who we are to be in this life beforehand. But also that once we are born those memories are removed from our consciousness. Although this is not recognized by Christians or cannot be found anywhere in the Bible does not mean it to be untrue. Many call this new age beliefs. How can it be a new age belief if it has been told to these people when experiencing an NDE. These people have not made this up on their own. When one thinks about NDE experiences. Would one believe a real life NDE experience from a bible thumping religious fanatic. I know I myself would feel they maybe had delusions due to their extremes in religion? Many NDE stories I have come across have been from normal everyday people, not religious fanatics. Yet I have also come across NDE's from religious clergy that have gone to Hell and back. Why because life is about growing spiritually with God and how one treats others while here on this planet not about how many times one prays the rosary or attends church service. Yet even with these messages God sends back people are still blinded by religion which was created by man. The reviews for this book will come down to those who have an open mind and believe Mary's NDE and those who will not. I feel Mary was given a second chance to life not only because she has much work yet to do. But also because through this story Mary can help many who may be feeling they are out of time to make a connection with God. Maybe they ignored God all their life and now are dying from a terminal illness or just old age. It is a message from God that he gives us all a second chance to be by his side, if not before than after death. God will not turn anyone away who is sincere about coming to him whether in life or after death. Death can be a really scary thing for those who have never given a second thought to God. There are many lost souls that can find comfort in Mary's story. A true story from someone who is not a bible thumbing fanatic and one has to be blind not to see that God purposely planned it this way. I think that Mary Neal’s book is important for people to read. Her incredible experience gives us hope regarding the purpose of our lives and the meaning of our deaths. She is a most admirable person and her book will be of interest and help to people who are interested in NDE’s, what happens to us when we die, and how we should try to live our lives in preparation for this. For these reasons, this book is invaluable.There were a couple of things in Mary Neal’s books that bothered me from a psychological point of view though, and I will list them:1. Her willingness to leave her children including a 1 ½ year old and go to Costa Rica and engage in a dangerous activity like intense white water kayaking that included 10-20 foot waterfalls in a isolated jungle area.2. She & her husband choosing not to go to a hospital in Costa Rica to get stabilized before medical evacuation to the USA after her kayaking accident. Their decision instead to check into a hotel for the first night and then to take commercial flights back to the US and then their decision not to go to a hospital in Salt Lake where they initially landed and to drive the six hour trip over the high altitude mountains into Jackson Hole. This was also very risky behavior that again nearly resulted in her death from Acute Respiratory Distress and Pneumonia.3. The subsequent repetition of risky behavior by “catching air” while off trail skiing with her son and breaking her ankle again placing herself at risk trying to hike back through the snow, over mountains with a broken ankle.4. The description of herself as a fifteen-year-old performing cesarean sections, and the missionaries she was with performing appendectomies in Mexico with no training, experience, and presumably no anesthesia or sterile fields. This was probably quite illegal and again very risky. It was also inexplicable. Why, what, was going on here? 5. Her not taking her son to a therapist for evaluation when her told her as a young child that he would not live past eighteen because this was “not the plan,” and again years later when he asked her to take out life insurance for him and wanted her to tell him how to write a will prior to his final trip where he died. I am deeply sorry for her and her family’s tragic loss. I just didn’t understand, was very confused about, what was going on in this boy’s mind, and I would have wanted an objective evaluation, a second opinion as it were. How would this have not been helpful? These psychological concerns do not take away from the value of Mary Neal’s book, the validity of her incredible experience, the strength and courage she has shown in adversity, and the help she continues to provide to her patients and everyone who reads her book. It also sparked curiosity in me to read more on the subject including Sam Parnia's excellent book, "What Happens When We die." As an RN, I was looking for a clinical explanation of what happened when she "died" and came back. What injuries she sustained? How her brain could have survived the oxygen deprivation? What brain injury would have been usual for that type of exposure? Who better to deliver that level of detail than an orthopedic surgeon? What I got was the usual "bright light and glowing nebulous beings" that fill most near death experience descriptions. There was vague timing and inattention to detail. For example, at one point she referred to an angel who spoke to her but in the same paragraph called him Jesus. The thing that really bothered me was her report that she "died" and then traveled from Chile via charter plane, commercial airline (lying to the flight attendants) and rental car back to Wyoming prior to seeking treatment for her injuries. That was just crazy and foolish. I guess my disappointment is that it is not what I thought it was. It was an interesting story with reassuring details of the after-life but convincing it is not. It did not strike me as much different from other stories about people who believe they have gone to heaven and returned. Gosh, I just don't know about this one. Certainly her survival and recovery is a miracle, but some of this book is just so "out there". An angel in the form of an owl sent to stare at her in order to convey a message (chapter 21)?? Not particularly well written, either. I'd give it 2.5 stars, but I rounded up. February 24, 2013 – Sunday. COINCIDENCE OR DESIGN? We all experience events in our lives that startle us from time to time. These occasions make us stop and ask our selves if what just happened to us was a coincidence or part of a greater, grand design or plan. Good fortune and luck falls into this category. I consider myself a very fortunate person. Years ago a political critic and opponent of mine accused me of living a ‘charmed life’, something I took as a back-handed compliment. Its true. I have been the direct recipient of many blessings that have come my way that I neither felt worthy of receiving nor could explain how my own actions had brought about such good fortune. I have also suffered loss, pain, and sorrow in my life, though much less frequently than the good that has come my way. Why good things happen and bad things happen to us is one of the great mysteries of life. Who of has hasn’t asked, “Why do bad things happen to good people?”The book “To Heaven and Back” by Dr. Mary Neal, answers the question of coincidence and design. Her story, both sad and happy, relates her own near death experience and its impact on her life, followed years later by the dramatic loss of her 19 year old son and other trials and challenges that brought her to an understanding of God and His purposes for us here on this earth. The great and terrible question “what happens to us when we die” is answered in her book. A skeptic both by nature and by training, Dr. Neal reveals the need that we all have to defer to the wisdom and love of a higher power, one that loves us, one that has a plan for each of us who lives here on this earth.SPIRITUAL VS. RELIGIOUS. One of the takeaways for me in this book is the difference between a religious life and a spiritual life. One can be observant and religious without necessarily being spiritual and vise versa. Dr. Neal says that both spirituality and religion are important and both should have a place in our lives. But ultimately we need to understand who God is, how much he cares for us individually, as well as collectively, and that worshiping Him is a vital and necessary daily activity for us in our lives. KEEP A JOURNAL. Dr. Neal challenges her readers to keep a journal for six to twelve months to keep track of the coincidences that happen in their lives. Perspective helps us understand the how our lives are part of a design rather than a series of unrelated events. In the journal she suggests that we write the details of the coincidences that happen to us over a period of time. In one column we should write the details of each major event that has taken place in our lives, such as acceptance into college, marriage, finding a job, choosing where to live and so on. Note every time that the arrangements fall easily into place. Similarly every time you struggle with a situation write down the outcome. Write the bad things that happen to you and to others and in an adjacent column list what happens as an indirect result of these bad things and the lessons that were learned. At the end of the exercise she believes that we will see patterns that are not statistically explainable. In other words, the events will be linked and have an element of design giving assurance that God has a plan for us in our lives. We will begin to recognize coincidences for the miracles that they really are, and that God is with us even in times of loneliness, misfortune and sorrow.CONCLUSION. “Lets not let life muddle what really happens…we are all part of a great miracle” so quoted Mary in the final pages of her book. She also quotes Martin Luther who said “Faith is taking the first step even when you don’t see the whole staircase”. For each of us it is important to move forward with our goals and work to align those goals with a greater purpose in life. We must set those goals carefully and prayerfully deferring always to a higher source that may take us by another path to the place He wants us to be. By having this kind of faith, and believing that what you do really matters, helps you Get Where You’re Goaling. To be sure, the author, orthopaedic surgeon Mary C. Neal, MD, encountered some seriously traumatic experiences, once in 1999 when she nearly died in a kayaking incident and again ten years later when she lost her son in a senseless automobile accident. This woman has had a lot with which to process and cope. On a personal level, my heart goes out to her and wish her love and support.This book, however, is a different matter.I found it to be a 220 pages of exasperating religious witnessing that took a long time to read because I couldn't get my eyes to stop rolling. Neal believes she died, went to heaven, and walked with angels. However, it wasn't her time because she had more work to do (I guess clerical errors are not unheard of in Heaven), so she was resurrected. In recovery, while her vision was failing, she was visited twice by an angel (or Jesus or God, she's not really sure, and why would you even ask?) who revealed to her the mysteries of the universe. The most interesting highlight from the truths revealed to Neal by God's agent: Before we're born, God gives us our life's mission. We get to review it with our "planning angel" (her words). We apparently have what she calls "branch points," during which we can literally retire (die), or get a new job. (Any similarity these divine plans have to contemporary professional career tracks an MD might be familiar with are purely coincidental.) She also tells us that children can remember heaven from before they were born. The younger they are, the better they remember, so the next time you see a two-year-old, be sure to ask!Of course, this may sound a little farfetched to some secular disbelievers (whom Neal recounts having made a habit of avoiding throughout her life); but the reader should take the author's word that what she experienced is true. Not that she ever refutes or even acknowledges the existence of any other prevailing neurological causes of an experience like hers; but because she lets us know from the get-go that as a doctor and woman of science, she's a "skeptic" who "understands numbers and statistics," which should presumably put any questions of her objectivity to rest. She repeats this characterization several times in the book, including once when the assertion follows a chapter in which she claims an owl perched outside her breakfast nook, urging her to visit her ailing step-father just before he passed away. (Although to be fair, she later realized it was an angel just disguised as an owl; and who among us hasn't fallen for that old trick? )Neal is quite up-front about being a lifelong churchgoer, Bible literalist, who has repeatedly searched for ways to make God more central in her life, and believes that what people call "coincidence" is actually God's intervention (either directly or via angels, it's not entirely clear). Despite this religiosity, she wants us to know that she wouldn't characterize herself as being "deeply religious or spiritual" before her death and subsequent resurrection.While I found the book to be mostly harmless, there were a few instances in which I found the author's perspective a bit oblivious. The most shocking example is that even though she is intimately aware of the brutally horrific genocide in Rwanda from Tutsi priest Father Ubald (Chapter 32), she really isn't convinced of the notion that "bad things actually happen to good people" (Chapter 17). I hope to God she hasn't shared this viewpoint in the presence of people affected by tragedy on that level.Although most of the chapters start with an obligatory Bible passage, chapter four is kicked off with a quote from Emerson: "People only see what they are prepared to see." I can only presume the irony is lost on the author. I've read a dozen or so books about near death experiences and I've found that I prefer the books that focus on the details of the event rather than trying to convert everyone who opens up the book. People can believe whatever they want and write books about it too. It's just not very fun to read in my opinion.Some bits that stuck with me from this book:"I believe that when people with near-death experiences describe "seeing the white light" or "moving toward the white light," they may be describing their moving toward the brilliance of this hall. Our vocabulary is just not right enough to describe the experience in a way that is understandable." pg 73 Eben Alexander discusses this phenomena too.Metaphor about life: "The complete tapestry (of life) is far too large for us to see and too complex a pattern for us to appreciate the importance of our single thread. Regardless, without our individual contribution, the tapestry would be incomplete and broken We should, therefore, recognize and take joy in our contribution. Indeed, our threads- our lives- are important; what we do and the choices we make, even the seemingly small ones, actually make a difference. "pg 102 I agree with that.If you liked To Heaven and Back, you may want to read Embraced By The Light by Betty J. Eadie or Heaven is for Real: A Little Boy's Astounding Story of His Trip to Heaven and Back by Todd Burpo. Both of those books are non-fictional accounts of near death experiences with the same religious zeal of this one. Try Dying to Be Me: My Journey from Cancer, to Near Death, to True Healing by Anita Moorjani or Proof of Heaven: A Neurosurgeon's Journey into the Afterlife by Eben Alexander for a more spiritual rather than religious spin on the experiences. This is one of those books that someone gave to me and told me I "just had" to read it. The genre of book (someone dies, goes to heaven and then comes back to life) is not something I would normally read. But, out of respect to the one who gave it to me, I read it. You could read my review on the other book from this genre which I read, because my feelings are much the same. The author of this book is credible, being an adult, a medical doctor and a parent, but the reflections on heaven are the same. Her book goes beyond just a heavenly vision, however. She see angels, then sees an angel in an owl that visits her house. She imagines that the dead are helping trees blossom and reassuring her through a variety of natural means. Her theology is a bit off too, for instance, she talks about the preexistence of souls that are sent to inhabit babies, who are in touch with the spiritual, angelic world, but then grow up and forget all the wonder of that place. I could say more, but take it from me, you don't want to read this book!! Within the last few years, I've greatly enjoyed reading a couple of books that recounted the testimonies of those who claim to have had experiences in heaven. Don Piper's book 90 Minutes in Heaven was amazing, and his continued testimony of how he has endured physical and emotional pain since his return is inspiring. I had the pleasure of meeting him a couple of years ago, and I look forward to finishing his follow-up book of encouragements, Heaven is Real.This past Christmas I also read the jaw-dropping story of Colton Burpo in Heaven is for Real, which has spent many weeks on the bestseller lists. In both cases, I was awed, inspired and given so much hope from the experiences of these two individuals. As a Christian I do believe in heaven, but to hear direct testimony from these guys was just incredible. And while their stories are amazing, I felt comfortable believing in what they've been sharing with their audiences.Recently I saw Dr. Mary Neal on a national news program sharing her own heavenly story as well, and my interest was piqued. I read her book To Heaven and Back, and while I found it interesting and at times amazing, I didn't feel as compelled to buy into everything that was shared in her story. I believe that she's sharing from her heart, that she has good intentions and that she did have these experiences. I just felt that theologically there were some "red flags" in her story. I always try to apply what I know of God's word whenever I hear stories like hers, and for some reason, I felt that some of it just didn't line up.I'm not trying to discount eyewitness accounts of miracles that most certainly occurred the day of Dr. Neal's accident. I do believe in miracles, both ancient and modern, and I do accept that many miraculous things have happened to Mary. There were just some subsequent spiritual moments and revelations in her life that I cannot be certain were from the Lord.For example, she believes that we existed before our birth here on earth, and that we have already seen the basic outline of how our lives are going to play out. She also believes that very young children still hold the memories of their pre-earth lives. She states:"In preparation for our journey to earth, we are able to make a basic outline for our life. This is not to imply that we, the humans, are entirely in charge of our life's design. It is more like God creates it, then we review it and discuss it with our 'personal planning' angel. Within the algorithm are written branch points in our lives at which times we may exit, returning to God, or we may be redirected to a different task and goal. "I know that Dr. Neal is just writing from her heart, sharing what she has experienced and truly believes. I also know that there is much about the spirit world that we cannot begin to comprehend, sometimes making it very difficult to verify. There are forces that can disguise themselves as angels of light, deceiving us into believing things that seem to be lovely and true, but in actuality go against what the Lord has told us in His word.Unfortunately, I'm not enough a Biblical scholar to specifically refute the things that didn't sit well with me in this book. Much of To Heaven and Back was encouraging and amazing, showing God's definite hand in the life of this intelligent, caring woman. There were just enough doubtful elements that keep me from accepting the whole of the book. My recommendation would be to read her story with both an open mind and a skeptic's heart as well. There's much to learn from Dr. Mary Neal's testimony, but I would take care as you experience it for yourself. "Many have said that my experience is remarkable. What I find more remarkable, however, is how readily many people in our society believe outlandish and unsubstantiated urban myths and conspiracies (Pop Rocks and Coke, JFK assassination, AIDS is man-made, etc. ), yet disregard thousands of personal and consistent testimonies of miracles and near-death experiences from people throughout all cultures and religions." (pg 205).Dr. Mary C. Neal, an orthopedic surgeon, thought she had an understanding of heaven, angels and Jesus being a believer from a young age, but nothing would prepare her more, than dying and getting first hand knowledge that everything she ever believed was not only true, she had to tell others. That is precisely what she did many years later after her children had grown from when she first drowned in a kayaking accident in Chile.That is the one significant thing in talking with anyone who has died, gone to heaven and returned, they never forget the precise details no matter how long it's been. Unlike trying to recall a wedding or even the birth of a child, the longer you wait in between talking about it, some of the details fade. Mary Neal felt God was now telling her to take what she experienced and not only share in through her words in a book, but even now she incorporates that into the care of her patients as well.In the novel, To Heaven and Back, Mary C. Neal describes her life leading up to her death and what happens long afterwards, sharing with the reader how many of the events could be described by some as luck, good fortune or karma. However when you connect the dots in all these circumstances, it becomes clear, that God's divine hand was orchestrating it all and in fact continues to do so. Not much time is spent on her time in Heaven since she wasn't allowed in, but merely got up to the entrance point, but what lives on even now in her life, continues to impact those around her.I received To Heaven and Back compliments of WaterBrook Multnomah Publishers for my honest opinion and truly believe what Mary experienced is real. To doubt her word, would mean you had more information into what happened than she did, and I would find that hard to believe. Mary isn't hoping to make a profit off her experience and is in fact donating portions of the sale of this book to many non-profit charitable organizations you would find on her website.The one thing that remains consistent for me, in reading her story is prayer to God was invaluable not only in the difficult roads in her life, but offering up thanksgiving and gratitude in those prayers as well. Being a huge believer in the power of prayer, I LOVE how simply stated Mary's experience truly was and gives me hope that we will live a long eternal life after we simply finish our jobs here. I rate this book a 4 out of 5 stars in my personal opinion and it's a great source of comfort to those wondering if life exists past this one besides the Bible and who may be grieving. I've always been inspired by people's accounts of being in Heaven. Whether they've had a near-death experience or they've been given insight into Heaven it's a sign to me that Heaven is real and that God's promise to us is true. So when I was given the chance to review this book I jumped at it. While I may be a bit impartial on the subject I did truly enjoy this book. Mary's story is inspirational. What I loved about her story is she wasn't perfect. She admitted that when her life was crazy - school, family, work, and just life - she had put God on the back burner and went about trying to make everything work. And yet she was still chosen to be a messenger, this imperfect woman was taken to Heaven so she could share with people that it is real. It inspires me to think that even though I'm not perfect and I don't always put God in the fore front of my life, though I do try to be aware, I am still capable of doing great things for God. And I think that's at least part of what her story is about, you don't have to be perfect in your love for God because he realizes that we're not perfect. Mary's life, like most of our lives is filled with great joy and great tragedy. Going through those emotional highs and lows with her really pulled me into her story. I wanted to see how she dealt with her experience in Heaven, how she dealt with her sorrow over being sent back, and how she took that experience and the instructions given to her and turned it into the positive and inspirational story she shares with us. Her life wasn't easy after her trip to Heaven and while she tried to do what she was instructed to do - share her story with the world - she had many upsets in her life that kept pushing that goal to the back burner. I can't say that I would have been able to deal with what she went through as well as she did, but I would hope that like her, I would be able to eventually push aside my insecurities and listen to what God was saying to me. This was a really good book. I would have like more information about her time in Heaven and her meetings with angels, but I understand her feeling that some of that was veiled to her for a reason. So I can't really blame her for not being able to include everything. Even with out the overt details I would have liked to read I was still inspired by her story and hope that I can live my life a little better with the added insights this book had given me. The fact that the author of To Heaven and Back is a superbly well-qualified medical doctor is what drew me to choose this book from amongst all the other recent publications depicting visits to heaven. I wanted to know how someone who is truly a scientist might interpret and define her near-death experience. This book provides a well-written journal of events, starting long before the author’s accident so the reader can correctly recognize that she is both believer and scientist. She’s also a very real person with a family that she cares for, living in a community that cares about her.With many books of this type I might ask, did she really die? In this book the author avoids the question by listing the amazing coincidences that led to her not dying. She should have died. And something awesome happened to her as she waited to die. It’s impossible to read this account without recognizing, whatever your belief, that the author is genuinely determined to tell her story exactly as it occurred.The story doesn’t end with a vision of heaven. More visions come later, even intriguingly carrying that same secretive nature of visions in the Bible. But Mary returns to her medical practice and her family, memories retreating into the past. She promises to write about it sometime and always puts it off.The author is changed by her experience of course, as anyone would be changed by almost dying. But a sudden urge to write later in life is "coincidentally" tied to what happens straight afterwards, raising that question again--not so "much did she die?" or "was it real?" as "where do all these coincidences come from? "I believe, with the author, that they come from God. I might not interpret everything the same way she does, but I thoroughly enjoyed arguing and talking with her in my head as I read her account. I recommend this book to anyone who imagines scientists don’t believe or can’t accept the spiritual. I recommend it as well to anyone who’s lost someone dear to them, or who’s seeking assurance that there truly must be more to life than just our everyday experience. It's a well-written, engaging, fascinating and truly absorbing book.Disclosure: I received this book for free from WaterBrook Multnomah Publishing Group for this review. Interesting book. I already believe that heaven is a real place. I already believe in God. I believe the Bible is true. Since I AM a believer, I didn't need convincing. I don't know that this book would convince someone who WASN'T a believer to become one. I almost totally accept her "Logical Conclusions" at the end of the book---Heaven is a real place, nothing can separate me from God's love, I have work to do, God will see me through. I would modify the one that said "God's promises are true." to God's WORD is true. Several portions of her story correlated to what my father said when he was at the end of his life. He saw angels in the room with us. He felt that just out of his earthly sight, there was a group cheering him on---he referred to them as a cloud of witnesses. He said he could almost hear them, but it was muffled like the sound was coming through a wall, but he KNEW that they were waiting for him and encouraging him.What I didn't agree with were 3 points in her book: 1. prior to coming to this life, we outline our lives and the plan is to develop the fruits of the Spirit or help others to do so. 2. children remember the time before they came to this life. 3. After death people are given a final opportunity to accept the love of God or to reject it. I don't believe these ideas are scriptural. I believe that God knits us in our mother's womb. I believe that we have freewill and make choices in life that have real consequences--good and bad. I would LIKE to believe that after death we could choose Jesus then, but I don't believe that is the way it will work. I was also disappointed with the lack of focus on Jesus. The Bible is very clear that HE is the only way to the Father. I absolutely DO believe that this woman had a death experience. I believe that she met with spirits after her drowning. I believe that God DOES have a plan for her life. I also believe that if we all took the focus off of ourselves and onto living the lives that God wanted us to live, the world would look very different. A very moving story of a near death encounter. All of the books about near death encounters vary substantially about how people experience and perceive their God and Heaven. I am a firm believer that our God speaks to each of his children in different and diverse ways. It is not my right to make judgments of how others worship their God or how they perceive what Heaven is like. In 2010 I had two dreams that allowed me to experience death, Heaven, and a personal encounter with the God of Scripture. The dreams allowed me to experiences what will happen to me at the end of my journey of faith. I have recently published a book titled At the End of Our Journey that tells the story of my faith and dreams.As I read the book by Dr. Neal and heard her trying to describe her experiences of God and Heaven, I felt she had the same difficulty and inability to find words to describe our mutual experiences. I had errie feeling that we had copied each others words when trying to describe our experiences.In summary I enjoyed this and other near death encounter books that I have read. I can accept that we all differ about how we perceive our God and Heaven. I can enrich and grow my own faith by hearing about the diverse ways God speaks to us. I give thanks to the authors who share their personal experiences with our mutual God. Dr. Neal's account of what she experienced after dying and returning is fascinating. What's more fascinating to me, though, is the series of incredible events throughout her life and how she coped with them (i.e. family deaths, patient deaths, etc.). The descriptions of the premonitions about her son Willie's death gave me chills (especially what he said to his friend minutes before the tragic accident)...I don't think I'll ever forget the scene those words created in my mind. This book is written by Dr. Neal, in her voice - definitely that of a doctor, rather than a professional story writer but I think leaving it that way, sans a ghostwriter or a writing coach was the way to go. It felt more like sitting in a room with her and hearing the story exactly as she'd share it and for a story like this, I think that's fitting. I enjoyed it thoroughly. Inspiring. I too was intrigued by the blueprint idea of God's tapestry plan for us. I've heard it before and discounted it because it's hard to imagine okaying some of our life traumas. The way she puts it, though, it rings true. These important points she mentions, like choosing and getting into college, changing jobs, changing careers, choosing a spouse, those are all times in my life riddled with coincidence and what I recognize as providence. I loved her advice in the end to keep a journal about these points to get a greater picture of how God has worked in your life. That's something I hope to do soon. Dr. Neal knows what really matters. Her book serves as a deep and moving reminder to readers of those things. At the end of this book, the author allows a few readers to ask questions, and one was basically had she made the story up to make money. NOT! My life has been very difficult this year, losing a job, not being able to find a new one, 4 kids to feed, the holidays coming up . . . my faith was starting to waiver. Reading this book renewed my faith, made me realize there are angels taking care of us (while reading, I stopped for a moment and asked into the air please show me a sign, and my cell phone buzzed - coincidence, I think not), and my overall fear of death, which has plagued me with panic attacks for years, is overall diminishing. I truly loved this book and will keep it on my shelves forever. Reading this book was like listening to a terribly dull acquaintance with something fascinating to say. I was intrigued by her story and inspired by its message but it was so pedestrianly written and took so long to get to the events themselves, then when it did she did not tell you enough about them, and lacked the powers of description to bring them to life with the luminosity she obvioulsy felt. I am probably being unfair to her as she is an MD not a writer, and i suppose the matter of fact way in which it is written adds credence to her testimony. I have certainly taken something away from this book which will stay with me, and for that i thank her for writing it down. Very inspiring book! I have read quite a few books on life after death and the commonalities of the experience across all different Christian faiths is remarkable to me. I would like to read the death experiences of Muslims, Jews and other sects to see the similarities. I realize even more that God loves all people and wants them to return regardless of their religions here on earth. I wish we could all remember that and live in peace practicing whatever religion we choose. This one grabbed by attention while browsing in the library today. Couldn't put it down, and I just now finished it! This is the true story of an orthopedic spinal surgeon (always a hero in my view) who experiences death and returns to tell what happened during her drowning. Inspiring, faith building and encouraging to say the very least. It brought chills and tears to read not only of of her courage and confidence but also of her personal doubts, scientific skepticism and personal feelings of failure and despair. Ultimately it's her hope, humility and humanity that convince me of her experiences. This is a quick read that will stay with you forever.